Thank you to all our families who made this year's Christmas Fayre the most busiest it's ever been! The children enjoyed making crafts and baking in their class during the week to sell at the fayre. As always, we really appreciate the donations sent in, the volunteers and the staff who give up their time to ensure the event is successful! The school choir singing Christmas carols and songs made it all very festive indeed! This year as part of commemorating 1oo years since the end of WW1 the school chose to support The Royal British Legion's Poppy Appeal with merchandise being sold each day in the week up to 11/11. Well done to Stevie and Emily from Year 1 who gave up their own time each morning to sell in the Key Stage 1 yard. 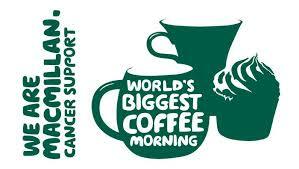 The Mini Vinnies organised this years MacMillan Coffee Morning on Sept 28th. They helped advertise the event, bake some delicious muffins and of course, help sell the enormous range of cakes that our families kindly donated. Families who attended were able to enjoy a lovely cup of tea or coffee and a slice of cake. Their efforts helped raise a fantastic £349.99! Our families had lots of cakes to choose from! The Mini Vinnies were great sales people. The best part was getting to eat them!